Simon McCormack Bars around the East Village, including The Continental (top) and the 13th Step, regularly offer promotional deals on alcoholic drinks. Research has found a link between those promotions and instances of binge-drinking. Kelly Kellam and Michael Russinik were walking on Third Avenue near St. Marks Place when something caught their eye. 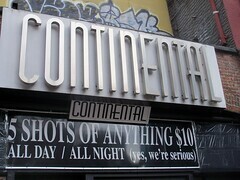 Mr. Kellam and Mr. Russinik said they would not have come into The Continental if it weren’t for the prominently advertised drink special. 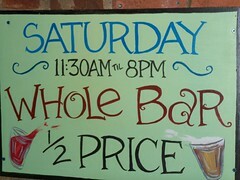 But do bargain drink prices at bars encourage people to drink too much? Susan Foster, vice president and director of policy research and analysis at The National Center on Addiction and Substance Abuse at Columbia University, said bars have a major impact on drinking culture.